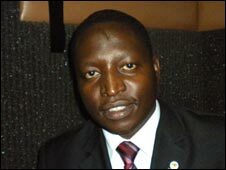 Dr. Warren Throckmorton reports that David Bahati, author of Uganda’s “Kill the Gays” bill, was denied entry to an economic summit in Washington, DC. He arrived mid morning and was informed of the decision. It turns out that we didn’t have his proper e-mail address for his phone. There was a frank but calm discussion and Mr. Bahati was not able to enter the building. There is heavy speculation that Bahati used the economic meeting as a front to coordinate his anti-gay eliminationist campaign with prominent evangelicals — such as the C Street Family. If you are in DC or New York City and happen to see this madman, do not hesitate to confront him. He is our Hitler and should be treated accordingly. Make it very clear to him that we will not willingly walk into his prisons or death chambers without a fight. Bahati will be on the Rachel Maddow show this evening to discuss his psychotic fixation with LGBT people — who are innocent and have done nothing to harm him. Yet, he wants us imprisoned or dead. In my view, Bahati’s visa should be denied and he should immediately be arrested and deported. The United States and other civilized nations should make Bahati and anyone connected to the Kill the Gays bill international pariahs. If the bill passes, he should be arrested for crimes against humanity. This video is an example of what this atrocious monster has done to peoples’ lives.